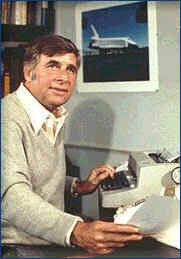 GENE (EUGENE WESLEY) RODDENBERRY. Born Eugene Wesley Roddenberry in El Paso, Texas, U.S., 19 August 1921. Educated at Los Angeles City College; University of Miami; Columbia University; University of Southern California; honorary D.HL. from Emerson College, 1973; honorary Doctor of Science from Clarkson College, 1981. Married Majel Leigh Hudec (Majel Barrett), 1969, children: Darleen, Dawn Alison, Eugene Wesley. Served in U.S. Army Air Force, World War II. Pilot for Pan American Airways, late 1946-49; worked for Los Angeles Police Department, 1949-51; television scriptwriter, 1951-62; wrote first science fiction script "The Secret Defense of 117," episode for Chevron Theater, 1952; created and produced The Lieutenant, 1963; Star Trek, 1966 and Star Trek: The Next Generation, 1987. Recipient: Distinguished Flying Cross; Emmy Award; Hugo Award. Died in Santa Monica, California, U.S., 24 October 1991. The Making of "Star Trek" (with Stephen E. Whitfield). New York: Ballantine Books, 1968. Star Trek: The Motion Picture. New York: Pocket Books, 1979. The Making of "Star Trek: The Motion Picture" (with Susan Sackett). New York: Pocket Books, 1980. Star Trek: The First Twenty-Five Years (with Susan Sackett). New York: Pocket Books, 1991. Gene Roddenberry: The Last Conversation: A Dialogue with the Creator of Star Trek (with Yvonne Fern). Berkeley, California: University of California Press, 1994. 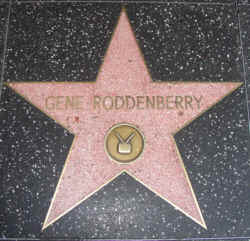 Gene Roddenberry was the first television writer to be honored with his own star on the Hollywood Walk of Fame (on 4 September 1985). Gene Roddenberry had an optimistic vision of humanity’s future-a future where poverty does not exist, one where technology is not the great segregator but the great equalizer..
Born in El Paso, Texas to Eugene Edward Roddenberry and Caroline Glen, Roddenberry spent his boyhood in Los Angeles, California, where his family had moved so his father could pursue a career with the Los Angeles Police Department (LAPD). Following in his father's footsteps after high school, Roddenberry took classes in police studies at Los Angeles City College, and headed that school's Police Club. In that role, he liaised with the FBI, thanking them for sending speakers and securing copies of the FBI Code and publications for club use, and attempted to take fingerprint records of the college community for the FBI's Civil Identification Division. He later transferred his academic interest to aeronautical engineering and qualified for a pilot's license. He volunteered for the U.S. Army Air Corps in the fall of 1941 and was ordered into training as a flying cadet when the United States entered World War II. Emerging from Kelly Field, Texas, as a Second Lieutenant, Roddenberry was sent to the South Pacific where he entered combat at Guadalcanal, flying B-17 bombers out of the newly-captured Japanese airstrip, which became Henderson Field. He flew missions against enemy strongholds at Bougainville and participated in the Munda invasion. In all, he took part in approximately 89 missions and sorties. He was decorated with the Distinguished Flying Cross and the Air Medal. While in the South Pacific, he also began to write. He sold stories to flying magazines, and later poetry to publications, including The New York Times. Upon his return from combat, he became a trouble-shooter for the Air Force working out of Washington, D.C., investigating the causes of air crashes. At war's end, he joined Pan American World Airways. During this time, he also studied literature at Columbia University. It was on a flight from Calcutta that his plane lost two engines and caught fire in mid-air, crashing at night in the Syrian desert. As the senior surviving officer, Roddenberry sent two Englishmen swimming across the Euphrates River in quest of the source of a light he had observed just prior to the crash. Meanwhile, he parleyed with nomads who had come to loot the dead. The Englishmen reached a Syrian military outpost, which sent a small plane to investigate. 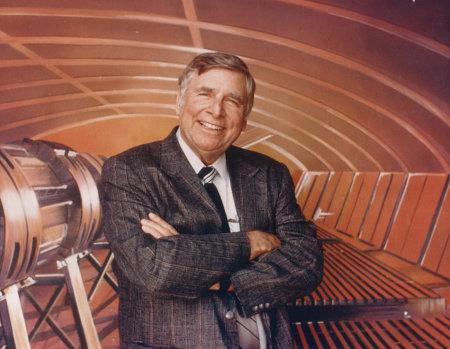 Roddenberry returned with the small plane to the outpost, where he broadcast a message that was relayed to Pan Am, which sent a stretcher plane to the rescue. Roddenberry later received a Civil Aeronautics commendation for his efforts during and after the crash. Back in the States, Roddenberry continued flying until he saw television for the first time. Correctly estimating television's future, he realized that the new medium would need writers and decided that Hollywood's film studios would soon dominate the new industry. He acted immediately, left his flying career behind and went to Hollywood, only to find the television industry still in its infancy, with few openings for inexperienced writers. At a friend's suggestion, he joined the Los Angeles Police Department, following in his father's footsteps and gaining experiences which would be valuable to a writer. By the time he had become a sergeant, Roddenberry was selling scripts to such shows as Goodyear Theatre, The Kaiser Aluminum Hour, Four Star Theater, Dragnet, The Jane Wyman Theater and Naked City. Established as a writer, he turned in his badge and became a freelancer. Later, he served as head writer for the highly popular series Have Gun, Will Travel. His episode "Helen of Abiginian" won the Writers Guild Award and was distributed to other writers as a model script for the series. Next, he created and produced The Lieutenant series, starring Gary Lockwood and Robert Vaughn; it told the story of a young man learning the lessons of life while in the United States Marine Corps. Star Trek followed (1966-1969). The first of the two pilots was pronounced "too cerebral" by the network and rejected. 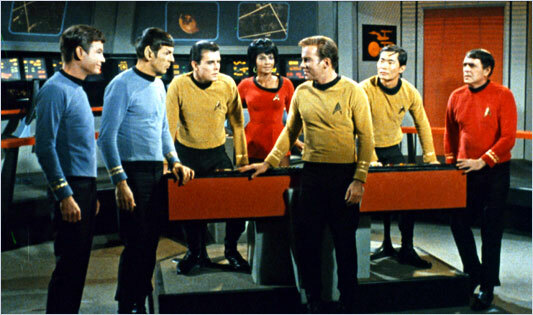 Once on the air, however, Star Trek developed a loyal following and has since become the first television series to have an episode preserved in the Smithsonian, where an 11-foot model of the U.S.S. Enterprise is also exhibited on the same floor as the Wright brother's original airplane and Lindbergh's "Spirit of St. Louis." 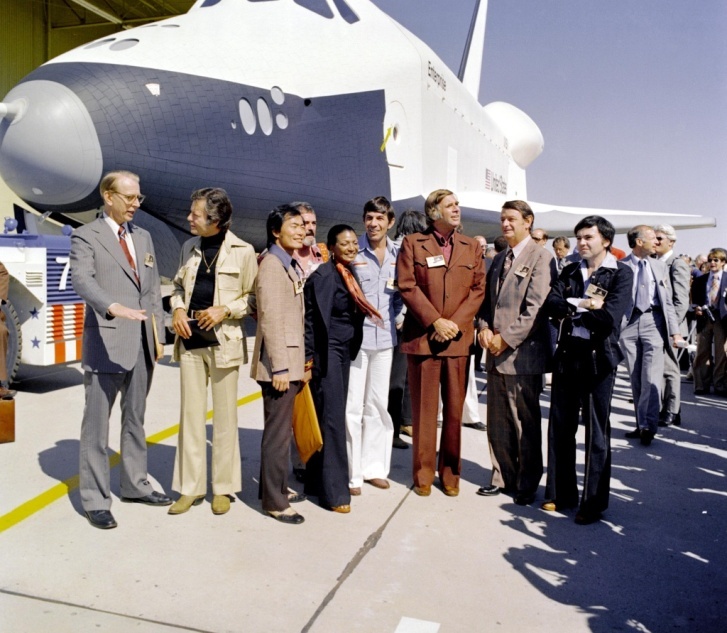 In addition to the Smithsonian honors, NASA's first space shuttle was named Enterprise. After the Star Trek series ended, Roddenberry produced the motion picture "Pretty Maids All in a Row," starring Rock Hudson, Angie Dickinson and Telly Savalas, and also made a number of pilots for TV. Among these were Genesis II for CBS (1973), about an Earth recovering from World War III. Next came The Questor Tapes for NBC (1974), the story of an android in search of his creator, then a sequel to Genesis II — Planet Earth, for ABC. He also co-wrote and produced "Spectre" (1977), a two-hour horror movie for NBC. Roddenberry served as a member of the Writers Guild Executive Council and as a Governor of the Academy of Television Arts and Sciences. He held three honorary doctorate degrees: Doctor of Humane Letters from Emerson College (1977), Doctor of Literature from Union College in Los Angeles, and Doctor of Science from Clarkson College in Potsdam, New York (1981). On September 4, 1986, Gene Roddenberry's fans presented him with a star on the Hollywood Walk of Fame, the first writer/producer to be so honored. Star Trek: The Next Generation, in its first year in syndication, was awarded with the 1987 Peabody Award for the "Best of the Best." The series also garnered many of the prestigious Emmy awards throughout its seven year run. In February 1990, the March of Dimes honored Roddenberry with the Jack Benny Memorial Award of lifetime achievement. On Thursday, October 24, 1991 Gene Roddenberry passed away and a world not so far away mourned the loss of one of television's foremost pioneers. In October, 1992, a year after his death, a canister of Gene’s ashes was sent to Houston to the care and keeping of astronaut Jim Weatherbee. The ashes were sealed in a slightly larger machined stainless steel cylinder. Accompanied by a 5" X 7" American flag the cylinder was carried on board the space shuttle Columbia and released into space. Roddenberry was married twice. He had two children by his first wife, Eileen Rexroat (to whom he was married 27 years) — Dawn, and the late Darleen. His second marriage was to Majel Barrett, who played Nurse Christine Chapel in the original Star Trek series, Lwaxana Troi, and the voice of the computer in all of the Star Trek series and several of the feature films. 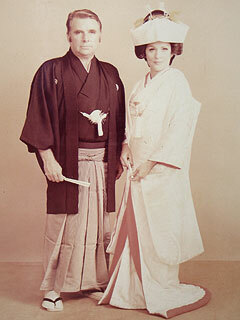 They were married in Japan in a traditional Buddhist-Shinto ceremony on August 6, 1969. He had one child, Rod Roddenberry, with Barrett. and Andromeda were produced under the guidance of Majel Barrett-Roddenberry. 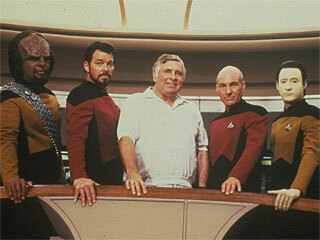 A third Roddenberry storyline was adapted in 1995 as the short-lived comic book Gene Roddenberry's Lost Universe. There is an asteroid called 4659 Roddenberry and a crater on Mars that were named in his honor. 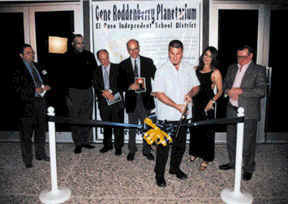 On October 4, 2002, the El Paso Independent School District Planetarium was renamed The Gene Roddenberry Planetarium. Eugene W. Roddenberry Jr. cut the ribbon at the dedication ceremony. For nearly 33 years, the planetarium went un-named. 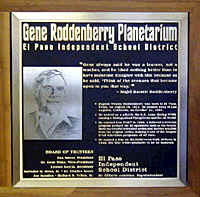 However, on November 13, 2001, the EPISD Board of Trustees decided that the name should be "The Gene Roddenberry Planetarium" to honor the life and vision of the renowned El Paso native. In the photo, EPISD Trustee Sal Mena, Star Trek actors Michael Dorn, Ethan Phillips, Robert Picardo and Marina Sirtis, and Apollo XII/Gemini 8 Astronaut Richard Gordon watch as Gene Roddenberry’s son, Eugene Wesley Roddenberry, cuts the ribbon to the entrance of the Planetarium. 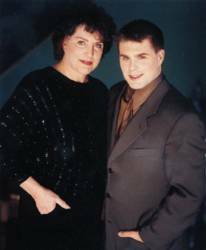 Eugene Wesley "Rod" Roddenberry Jr. (b. February 5, 1974 in Los Angeles, California) is an American television producer and the only son of Star Trek creator Gene Roddenberry and actress Majel Barrett. He is known for his work in science fiction, astronomy and space exploration. Rod is carry on the tradition of "boldy going where no man has gone before" with roddenberry.com. Eugene Wesley Roddenberry, Jr., also known as Rod, was born into a family empire that is adored by fans worldwide. He is the son of legendary science fiction producer Gene Roddenberry, whose television series Star Trek changed the face of television. Balancing his personal creativity with the responsibility of his family legacy, it is Eugene's ambition to be the guardian of his father's ideals as well as a champion of their introduction to a new generation. Although Eugene resisted going into the family business throughout his teenage years, hints of him starting to follow in his father's footsteps were evident even at a young age. He quenched his thirst for space and astronomy working as a Telescope Operator at the Mt. Wilson Observatory during the summer. Eugene spent time teaching children to scuba dive at a camp in Big Pine Key, Florida, encouraging them to explore the unknown worlds below the ocean's surface. And during his years at Harvard-Westlake School, Eugene first dipped his foot into the entertainment industry as a Production Assistant on several of the Star Trek spin-off series. Eugene's life changed dramatically during his senior year of high school with the passing of his father. It was at this point that he began to comprehend the enormity of the universe his father had created. Eugene realized that Star Trek was more than just a TV show, and wanted to understand why it touched the lives of so many. As Rod started to understand the legacy he would be inheriting, college beckoned. Leaving Los Angeles to attend Hampshire College in Massachusetts, Rod balanced his educational path with his familial exploration. Studying Astronomy, Physics, and Photography, he delved into areas that intrigued and inspired him. Rod also spent time learning about Star Trek as well as his father's life and work. Stories from millions of fans and Gene's own writings, helped Rod discover a new world of philosophy, social & cultural commentary and the in-depth examination of the human condition. 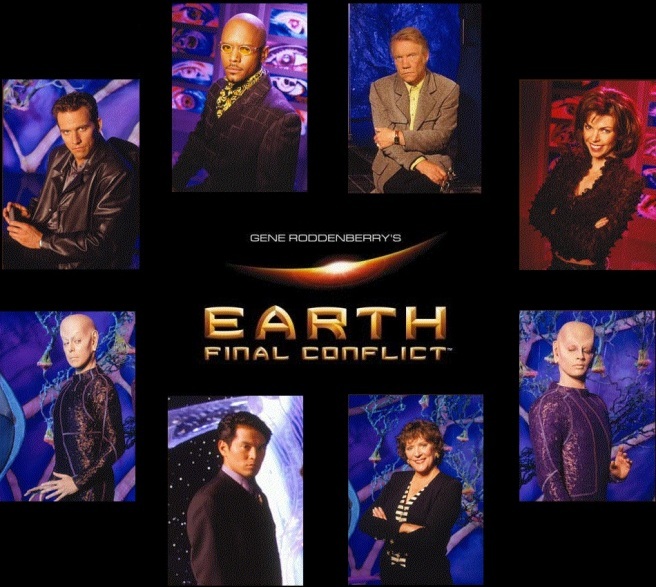 Nearing the end of his college career, Eugene got the opportunity to join the Gene Roddenberry's Earth: Final Conflict television series as a Technical Advisor. For the next four years, Eugene relocated to Toronto, Canada and gained production experience, working with a brilliant cast and crew. He also came to realize the difficulties and disappointments that come with the business that is Hollywood. On top of a strong production foundation, Eugene gained a new respect for his father's accomplishments and set a higher bar of integrity for any future project that carries the Roddenberry name. Since then, Eugene has spoken at science fiction conventions around the world and hosted worldwide forums on topics from literature to the future of space travel. He has taken a position as a board member on the X Prize (a private-sector, international space exploration competition), and tirelessly works to bridge the gap between science and science fiction by participating in efforts with NASA, JPL, The Planetary Society and The Kennedy Space Center. In 2001, upon returning to Los Angeles, Eugene reopened the family merchandising business. He has since expanded the company, creating Roddenberry Productions the promise of which is to bring the Roddenberry Spirit and Ideals to people in new forms, through new media. The organization pledges the development and production of many multimedia projects including the completion of Eugene's first independent documentary, "Trek Nation." As a documentary about the positive influences of his father's work and how it has impacted lives around the world, Eugene hopes that "Trek Nation" will pay homage to the fans who have sustained his legacy and the father who created it.